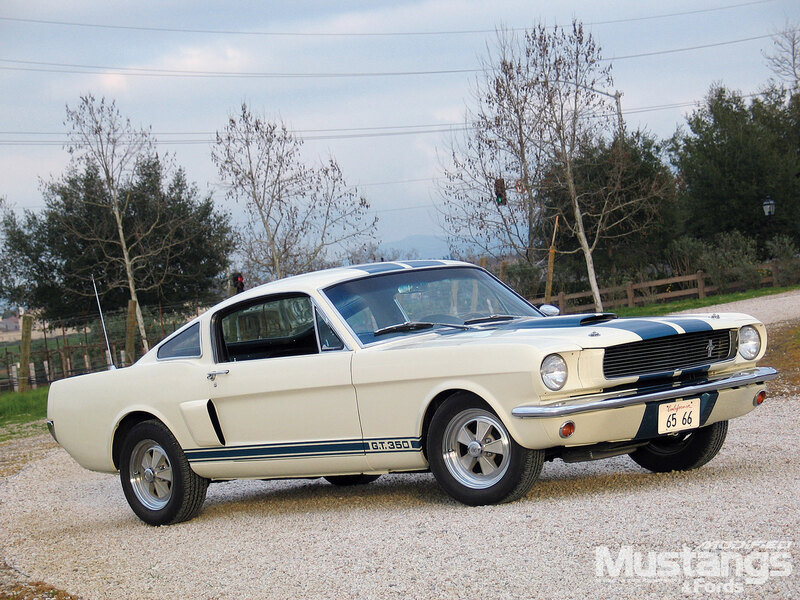 1966 is one of the most popular Ford Mustang model years in the history of the car. In fact, March 1966 marked the creation of the millionth Mustang. Although the first few years were very good for Ford and its sporty Mustang, 1966 was the year all the hard work really started to pay off. By 1966, most people began to associate the Ford Mustang with power and performance. It was the car to have if you needed a daily driver and it was the car to have if you needed a weekend cruiser with a sporty edge. 333 High Country Specials produced. Only 35 of the 333 were convertibles. The High Country Special was a promotion that Ford ran from 1966-68. The Mustangs came in three special colors: Timberline Green, Columbine Blue, and Aspen Gold. All came with special emblems that dealers were free to mount where they wanted. They were only sold in Colorado, Wyoming, and parts of Nebraska. Hertz corporation ordered 1,001 of the G.T. 350s to offer as rentals. The side stripes read “G.T. 350H”, but the cars became know as “Rent-a-Racers.” Some cunning Mustang owners would rent the Shelbys, swap the motor with the motor in their Mustangs, and return them to Hertz. At $17 per day and 17 cents per mile, it was a good bargain for a Shelby engine. It was “uncool” to own a former rental car, so many of the cars were debadged after they were decommissioned. Thanks to the Shelby American Automobile Association, however, many of these cars have been found. More than 800 were made in black, and the other 200 or so were divided between red, green, blue, and white. Only the black models and a few white ones had stripes on the hood, but many owners added them to the other cars during restoration. In all, there were minimal changes to the Mustang in 1966. Production began in August of 1965 and featured a line up of: Coupe, Convertible, and Fastback. In all, Ford produced 607,568 total Mustangs in 1966. The car sported additional new colors, a redesigned grille, new instrument cluster, and new styled wheels. An automatic transmission became available for the “Hi-Po” V-8. Side scoops featured chrome trim with three wind-splits, and GT models received a new gas cap and driving lamps as standard equipment. In 1966, Ford produced 499,751 Mustang coupes. As such, this model-year Mustang has been widely popular, with many 1966 Mustangs still on the road today. 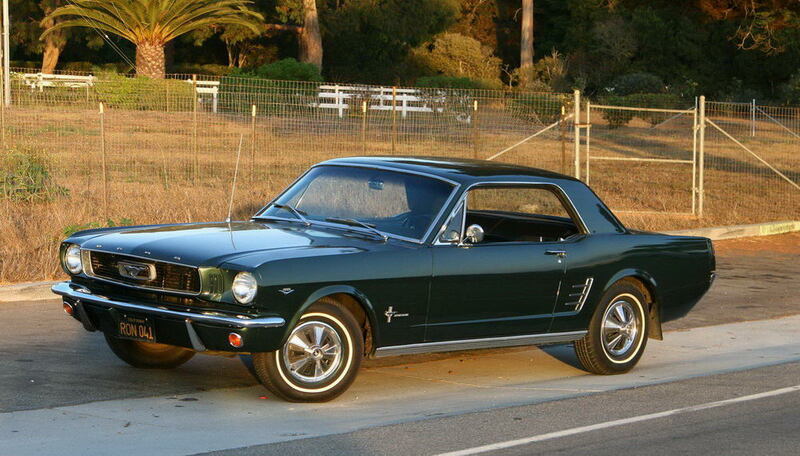 In fact, the 1966 coupe is the best selling Mustang of all time. The 1966 coupe featured a redesigned grille, new instrument cluster, and new styled wheels. An automatic transmission became available for the “Hi-Po” V8. Side scoops featured chrome trim with three wind-splits, and driving lamps were offered as optional equipment. The coupe Mustang, as with all Mustangs, other than the GT, featured the Mustang Pony emblem directly behind the front wheel wells. Those coupes equipped with the high-performance 289 engine featured a special Hi-Po 289 emblem on the fenders. 1966 was one of the most popular Ford Mustang model years in the history of the car, and the convertible model was no exception. 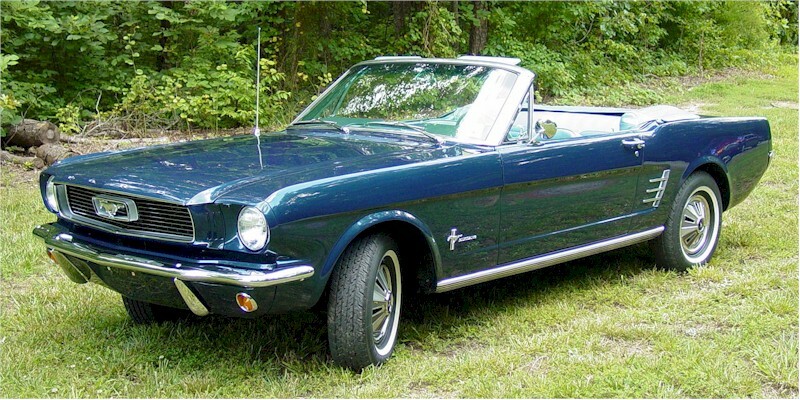 More than 70,000 convertible Mustangs were sold in 1966. In fact, although the hardtop Mustang outsold the convertible model, it’s been said the 1966 Mustang Convertible outsold the Fastback almost three to one. There’s no denying the convertible Mustang was a hot commodity. As for model year refinements, in all, the 1966 Convertible Mustang was very similar to the 1965 model. It did, however, feature a new grille pattern, a new instrument panel, and new color options, such as the addition of Emberglo. The grille of the 1966 Mustang Convertible featured, for the first time, a free-floating Pony emblem surrounded by horizontal grille bars. This provided for a sleeker looking Mustang, putting the previously used honeycomb grille pattern to rest. Ford also did away with the Falcon instrument cluster in 1966 and replaced it with five round gauges, which had previously only been available as an added option. The new cluster featured a large speedometer, fuel gauge, ammeter, coolant temperature gauge, and an oil-pressure gauge. The interior featured padded sun visors as standard equipment, along with an eight-track sound-system as an optional add on. The glove box was also redesigned and a new woven design pattern replaced the standard vinyl seats featured in previous years. For the upscale buyer, Ford offered the Pony interior package (Interior Decor Group Option), and what a package it was. It featured embossed seatbacks prominently featuring galloping Mustangs. It also featured walnut-grained vinyl dashboard and chrome trim throughout. Best of all, the cockpit featured courtesy lights and pistol-grip handles. Talk about creature comforts! In addition, the car’s convertible boot was color-keyed to match the vehicle’s interior. Additional upgrades to the 1966 Mustang convertible included new rocker-panel trim, optional remote mirrors, and the addition of Emberglo as a new color option. You could even order an antenna for your Mustang for about $60. 1966 was the last year Ford offered the original Mustang Fastback. Although the Mustang had a stellar year in sales, the Fastback experienced a 50-percent decrease in sales over the previous model year. In all, about 35,000 Mustang Fastbacks were produced in 1966, making this model highly sought after by Mustang collectors. In 1966, the Fastback featured a redesigned grille, new instrument cluster, and new styled wheels. An automatic transmission became available for the “Hi-Po” V8. Side scoops were absent on the GT model, making for a cleaner look, while driving lamps were offered as standard equipment. In addition, the GT featured side racing stripes which took the place of chrome rocker panels, giving the vehicle a serious performance racing look. Although other Mustangs in 1966 sported the Mustang Pony emblem directly behind the front wheel wells, the GT Mustang featured a special GT emblem in its place. In addition, the letters “MUSTANG” were added to the lower front fender. The GT also featured the Hi-Po 289 Emblem, making it easy to spot one of these V-8 classics on the road. 1966 was also the first year Mustang featured standard backup lights. One of the most distinct features of the 1966 Fastback Mustang is the car’s exit vents which work with the vehicle’s fully-functional silent-flo interior ventilation system. The car also came with an AM radio. Carroll holds the reins of Ford’s GT racing program. For the enthusiast this means a network of performance aftermarket parts are making their way to participating dealers. The 289 cid V8 again is the highest output option with 306 horsepower at 6,000 rpm. However, with the Shelby parts system in place, the Mustang fanatic can build their own street legal R-model. Thanks for the update. I am always ready to stand corrected. Perhaps somebody else has the answer and could let us know. It’s certainly an unusual situation. Send it over vin and door tag and i will what i can do. Any educated guesses on how many were made in W-White? Hi Mike, Forgive me I have lost your details in swapping over office suite on the PC. Please can you email me the details again and i will look straight into it again for you. Sorry. Hi, it looks like you may have had some parts swapped out. Thereally will be a tag on the door as well which will tell you the colour, interior spec, axle ratio, etc. Again this can all be decoded. If you send me details of vin and door tag I will decode it all for you and send you the pdf certificate of the details. Curious as what the difference in the Luxury and standard bodies were. I just had a 1966 fastback aquired to be fully restored for me. It is rare a its an A code that had a warranty engine replacement and they replaced it with a k- code engine (got the ford report documenting it). Its a GT with all the options possible on it. My question still is what is different in the luxury and standard fastbacks?? Most of the time the luxury refers to the interior trims. The body didn’t change really, the factory GTs had exhausts out the rear valance etc and badge changes. But the records for the 64-66 cars were destroyed so there is no official record of what was on what car. A lot of the time the dealerships would make a standard car into a GT or even respray the cars as demand was so high for a particular colour. The trims for luxury or “Pony” interior would be seat trims, gauge dash, glove box lid, and door cards. Instances of centre console, the rare over head console or perhaps the wheels options might have been included, but that was down to the dealership on what they decided as luxury for a sales pitch. It’s all very vague for those early years. The only way is to get the door tag and engine vin to decode the spec of your car. Send me the details and I will decode for you. I am thinking about getting a one owner 1966, white with blue interior, but the engine is a 6 cylinder, 200 cubic inch and an automatic. Can you tell me about the horsepower and what to expect when driving it uphill? Do you think this would be a good investment to buy? Hi Anne thanks for stopping by my blog. I am more than happy to tell you what I know about the i6 (inline six) cars, but if you want to get specifics for investments I would seriously suggest you speak to Adam at Mustang Maniac (plenty of links on my blog) who will guide you through it. Some are worth a lot more than others, the v8’s are the cars that everybody knows and loves for the look, performance and noise. The i6 was much quitter, pleasant cruiser but it still has that classic Mustang look. The i6 was rated at 120bhp with a standard single valve carb, just over half of what the standard two valve carb v8’s were. The Mustang is a big heavy car and lots of uphills in the UK could make it run hot, and on the other side of the hill the drum brakes that were fitted as standard are plenty good enough on flats, but not designed for sustained mountain driving and could fade if they get they get hot too. The brakes would be a good place to start for an upgrade, and the Evans waterless coolant (sold by Mustang Maniac) will stop the over heating issues. Paperwork is important to show the car has been imported and the correct duties paid in the UK. I have driven a couple of i6 cars and they are nice to drive. The 3 speed auto I suspect you would have is a smooth box and a lot less hassle than a manual 3 speed, maybe not as much fun though. If you want a classic look car that would be better on fuel than the v8’s then the i6 is a nice choice. The fastback versions tend to be worth more money as they were rarer. But, please do speak to Adam for market values and the right car for you. Hope that helps a bit. You just have to buy what you like. Mart. Hey, Mart…they are having a Mustang Memories here in Dearborn to mark the 50th Anniversary of Mustang. Yes, we continue to have celebrations since this is the home of Henry Ford. I would have loved to go but…$50 is a little too much for me right now. Price of admission includes a goody bag which contains stuff like a t-shirt, lanyard, badge, plaques and more!!! Sounded like a great idea until I got to the $50 part!!! I wanted so badly to go and take pictures for you but… Maybe there will be some in the newspaper or on the internet. Anyway, keep up your love of the Mustang!!! On second thought, maybe I can sneak over and catch some photos. Who would pay any attention to an old lady like me!!! By all means share my blog. Thanks for asking. you can see why most popular model – gorgeous! Thanks for checking out my blog. I Amy be a little bias here, but I think it was their best year! I would love any of these ponies from 64 to 69. What classic years they were. Colours can be a complete nightmare, I am at the stage where I need to think about ot too. I have gone from black to white, red to blue all shades there is in between. I have seen a 66 convertible in a dark Alfa burgundy red at that looks quite sweet. The question is from the vin code do you go back to the original colour or go for what you want? Hi, thanks for stopping by and the kind comment. Much appreciated. Thank you, I will pay it a visit. What a great blog. My son and I want to buy a car, restore it, and drive it in the Cruise some day. Talk about Wishfulthinking, huh??? Thanks for stopping by my blog and the follow. I didn’t know much about the restoration game but you soin learn. I would recommend doing it as the satisfaction when a little part you have worked on comes to life. It gives you a bit of a thrill. I so want to drive mine to a show or cruise but I have to be patient. There are more parts available for the first generation Mustang than I expected. As a bonus you get to meet lots of nice people who will help out where they can. Please feel free to ask away and I will help if I can. Wishful thinking indeed. My wish was to own one and drive it, im half way there now I hope. Thanks for the reply. You’re right about the nice people. The car environment is a great one!!! It didn’t look like my first reply went through so I’ll try again. Thanks for responding. The car environment certainly does contain some nice people. I’m excited about our venture into restoration. Welcome to the restoration world. Good question but I don’t know the answer, have you tried the Mustang Maniac Forum pages. There are some very well informed people on there who I expect would know. Thanks for visiting my blog. I can see that you definitely have the bug. Keep the faith! Thank you, one I will drive her. Not everyone can be the King of Cool, which is what everyone driving a sixties Mustang imagines themselves looking like. The first time I went to San Francisco it was ‘so familiar’, all I could hear was the jazz score from Bullitt. At present I’m building another Caterham, From the later sixties I have a TR6, a real buff of a car, but fast with the fuel injection. American cars, I would like to find a Roadrunner. Great blog. Thanks very much for the kind comment. I agree with you, being around any old mustang just makes you think of Bullitt, not everybody remembers the plot of the film but they sure remember the car chase though. A friend of mine had a TR6 and I was lucky enough to go out in once a long long time ago before they became the collectors cars they are now, it was fun then, let alone being fuel injected. Never been in a Caterham to be fair, not sure I would fit in one, but I may get in one someday for a blast! As for the Road Runner – ohhh yeah. Not many around especially over here, I would to have a go in one of them babies that’s for sure. My first car was a 1964 Mustang all 100% original. My dad told me I would regret selling it and he was right. 20 years later I’m in desperate need of a car. Worst part is my father is no longer around to help me look for one. You can email me via my contact page anytime. Thanks for the comment and taking time out to read the post.